“The Ring” is an unlikely hit for Hitchcock, as it’s a romantic drama set in the world of British boxing. Released by British International pictures in 1927, it stars Carl Brisson as “One-Round’ Jack Sander, Lillian Hall-Davis as the young ticket-taker who marries him, and Ian Hunter (not of Mott the Hoople fame) as Australian Heavyweight champ Bob Corby. Hitch is credited as screenwriter, although it’s been acknowledged that Alma Reville, who married Hitch in 1926, served as co-writer. The action opens at a carnival, giving Hitch the opportunity to create some great visuals. The first thing we see is a closeup of a hand beating a drum, which focuses our on the events that are about to unfold. Jack is an attraction at the carnival, one who will get in the ring with anyone. We watch a mustachioed barker goad several members of a crowd into entering the ring with Jack; they leave just as fast as the arrived, holding their jaws and looking stunned. Meanwhile, Mabel, the ticket-taker, is chatted up by tall, laconic Bob Corby, who decides to fight Jack as well, seemingly to impress Mabel. In the crowded, smokey tent, Jack knocks down one man after another, including a tough looking sailor. Finally, the overdressed Corby steps into the little ring, while Jack’s trainer sneers at him. Jack is shocked to find that Corby isn’t easy pickings. Corby wins the match, and after collecting his winnings, he and his friend tell Mabel that if Jack wants, he’s got a job as Corby’s new sparring partner. As the card they leave with Mabel reveals, Corby is heavyweight champion of Australia. While Jack prepares for his new career, Corby continues to hang around Mabel, giving her a gift he bought with the money he won by beating Jack: A silver armband shaped like a snake. She loves it, but it’s not easy to wear something like that and keep it hidden. Hitchcock is clever with the reveal, though. Living in carnival wagons as they do, Jack is shaving one morning by looking at his reflection in a pond, and when Mabel sneaks up behind him to spoil his view in the water, the armband slips off into the pond. Jack reaches it, but the secret gift is revealed. Jack continues as Corby’s sparring partner, and Corby continues hanging around Mabel, who doesn’t realize how jealous Jack is becoming. Jack starts to win his own fights, but the more time he spends training, the more time Mabel and Corby spend together, going to shows, eating dinner at fancy restaurants, and hitting swank parties. Finally, Jack wins the big match that gives him a shot at Corby – but when he gets home to tell Mabel, she’s out. Incensed, Jack goes out to find Corby at his favorite restaurant, but before he can confront his rival, he’s asked to dance. There’s another wonderful moment when the two boxers are dancing nearly back to back, unaware of each other. After an ugly confrontation at the restaurant, the night of the big fight arrives. Mabel sits in the audience, seemingly on Corby’s side, but when it looks like Jack is going to lose, she leaps to his side and tells him that she’s in his corner. He goes back into the ring with renewed energy and wins the fight. After Jack is declared the winner, he hugs and kisses Mabel, and the screen fades to black. 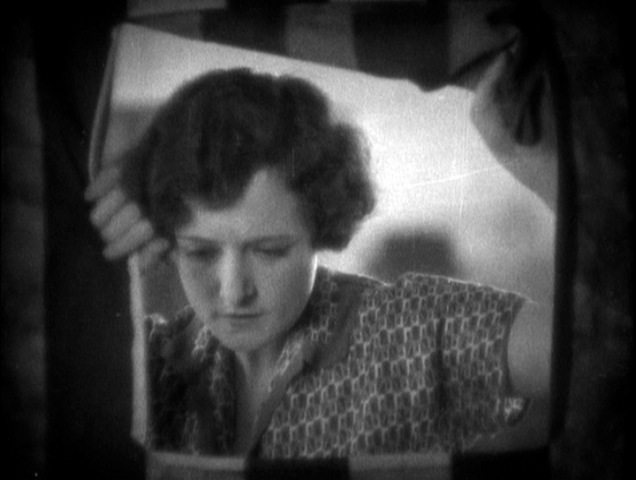 You’d think that was the end of the film, but there’s a coda: In Corby’s dressing room, as he’s getting ready to leave for the night (with nary a scratch on him! ), someone hands him Mabel’s armband, which she left behind. Smiling wryly, Corby tells the kid who brought it to him that he can keep it. Although “The Ring” is schmaltzy and predictable, especially in the second half, there’s as lot to recommend it. Hitch employs some remarkable tricks in his camera work, like the shots below. On the left, we see the point of view of a man in the carnival tent, imagining all the men Jack Sanders has beaten; on the right is a shot of Jack’s trainer drunkenly watching Jack and Corby pretend to spar across a table. Before I jump into my next Hitchcock picture, 1927’s “The Ring,” let’s make a quick detour to look at an amazing resource. I’ve mentioned the Hitchcock Wiki page before, which is in itself invaluable for anyone doing research on Hitch, his movies, collaborators, stars, etc. The site also includes an incredible page called 1000 Frames of Hitchcock. As the page explains, it is an attempt to create a library of frames from the 52 major Hitchcock movies – at 1000 frames per picture! 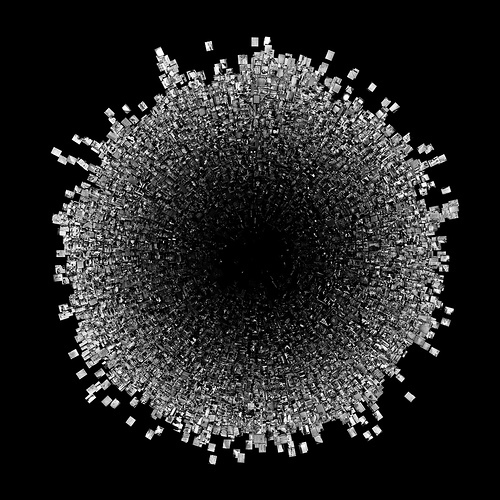 This image composes the 1000 frames from each film in 52 rows! Close up, the frames start to get pretty abstract. Almost looks like it belongs in The Museum of Modern Art, doesn’t it? Obviously there’s a lot to see at the Hitchcock Wiki, and I recommend it highly for anyone interested in film. This weekend, I’ll be back with a new post on “The Ring,” and we’ll see how Hitch treats the sweet science. “The Lodger: A Story of the London Fog,” Alfred Hitchcock’s second picture, was released in 1927. Based on a novel by Marie Belloc Lowndes (credited in the movie as “Mrs. Belloc Lowndes”! ), it was inspired by an urban legend about a landlady who thought Jack the Ripper had taken up residence in one of her rooms. The novel is about another serial killer, and the lodger did indeed turn out to be the murderer. Even though the book was a bestseller, Hitchcock made significant changes to the plot, something he would do time and time again through his films – although not for his usual reasons. In later years, Hitch’s changes were dictated by an interest in streamlining the story, or in changing it to suit his personal interests. In this case, though, the story changed because the star, the multi-talented Ivor Novello, did not want to portray a murderer. In retrospect, it’s easy to see “The Lodger” as the first true Hitchcock picture. The lodger is suspected of being a killer; the police are both bumbling and threatening, the pretty blonde is in danger. But at the time, it must have come off as a surprisingly adept thriller from a novice director, and it resonated with its audiences not only because the novel had been a hit but because in 1927, the memory of Jack the Ripper was still relatively fresh for residents of London. Eventually, Daisy becomes interested in the lodger, much to the displeasure of the cop. He puts a few clues together and decides that the lodger must be the killer. As usual in Hitch’s movies, the cop is wrong – the lodger is in fact on the trail of the killer, who murdered his own sister. There’s a lot of suspense in the movie, as we watch the lodger act in a suspicious manner, but the movies’ finale is all action: He’s arrested, breaks free, meets Daisy, takes refuge in a pub, and is chased and nearly killed by an angry mob. “The Lodger” had a lot to recommend it besides the story, though. Hitch had traveled in Europe and studied movies extensively, and “The Lodger” shows a director who wrote like a Brit, shot like a German and edited like a Russian. The movie has a distinctly German expressionist look, from the title card on. There are scenes that really demonstrate Hitch’s budding cleverness in his approach to psychological thrills, like the one in which Daisy, her mother and the detective hear the lodger pacing overhead. Looking up at the ceiling, they imagine him walking – and Hitch superimposes an image of him actually pacing (shot from below through a sheet of glass) against the ceiling. 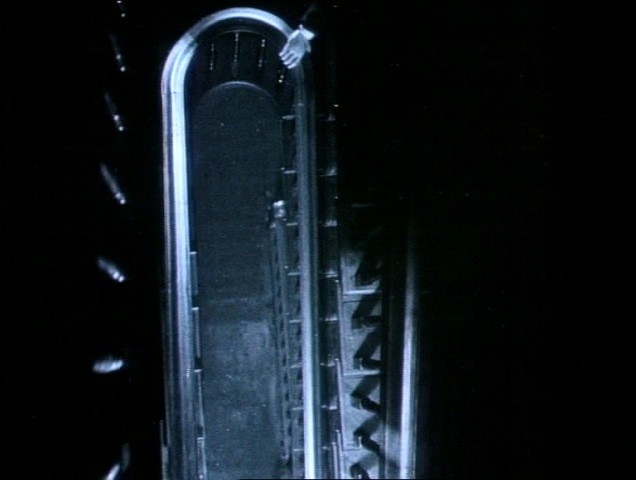 Another scene shoots a stairwell from above as the lodger descends, with only his hand visible. Later, as the detective sits in the park contemplating the clues, they appear, one after the other, in the footstep the lodger has just left in the dirt. It’s this sort of visual cleverness that quickly established Hitchcock as a master, even if his next few movies weren’t really thrillers. 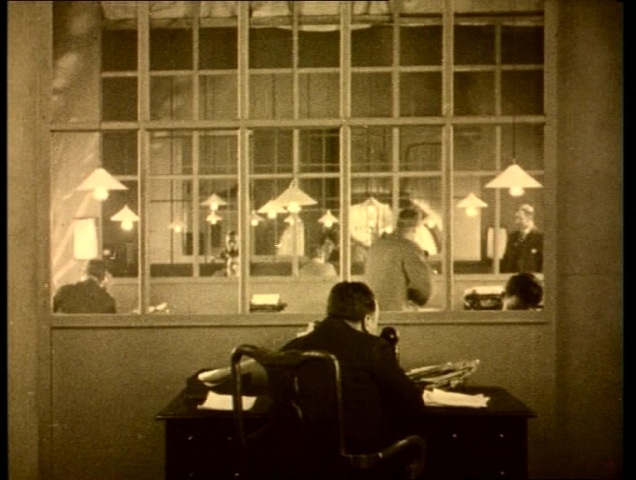 Lastly, since this sort of thing seems to be de rigeur, I’ll mention that Hitchcock appears in “The Lodger” toward the beginning of the movie, his back to the camera, seated at a desk at the newspaper office where news of The Avenger’s latest killing is being printed. If you watch the clip above, some people seem to think that he also appears as the man in the black hat just to the right of the lodger when he is hanging from the fence, but I’m not convinced, as that man appears to have a mustache. Rather than get things out of order by heading straight into 1926’s “The Lodger,” which I have on DVD, let’s take a brief look at “The Pleasure Garden,” the first movie directed by Alfred Hitchcock that survives to this day. I say “brief” because the movie is not officially available in the U.S., and while I may have a line on getting a copy at some point, all I have now is a bit of information, some photos and, lucky us, a video clip. “The Pleasure Garden” was released by Gainsborough Pictures in 1925, after Hitchcock had put in five years or so at the studios Famous Players-Lasky and Gainsborough as a title designer, set dresser, scenarist and co-director. Thanks to his champion, producer Michael Balcon, Hitch had already worked as director on the unfinished film “No. 13” and another called “Always Tell Your Wife,” of which only one reel is reported to survive, and on which he was uncredited. In an early instance of bringing an American star to England, the then-popular but now forgotten Virginia Valli stars as Patsy Brand, a chorus girl who works at The Pleasure Garden nightclub. The brief descriptions of the plot I found online say that Patsy meets and impetuously marries a soldier of fortune who is called away to a tropical colony before their honeymoon. She carries on with her life in London until she receives a message that he is ill. She rushes to his side, only to learn that he is both an alcoholic and shacked up with a native girl, and tragedy ensues. I’m sure there’s more to the story, and I hope to cover that if and when I get a copy of the movie, but what happened behind the scenes sounds more interesting than the plot. The movie was filmed on location in Italy and Germany, and the small crew had virtually no money. The actress in the role of the native girl was unable to shoot a scene in which she was to be carried in the water, owing to the fact that she was having her period; the only double they could find was too heavy to be carried easily. (The original actress playing the native girl didn’t speak English, and Hitchcock claimed later that as a sexual naif, he had no idea what she was talking about even with the help of a translator.) Problems also arose when the crew had to hide the film while carrying it across an international border to avoid paying the tax on it; they ended up paying anyway and ruining some of their reels. On the plus side, “The Pleasure Garden” brought Hitchcock together with Alma Reville, his closest collaborator, whom he would marry soon after. Reville had been working at Gainsborough on “continuity,” doing the job of a script girl: taking notes on lighting, settings, costumes, etc., so that they could be matched properly in different shots. 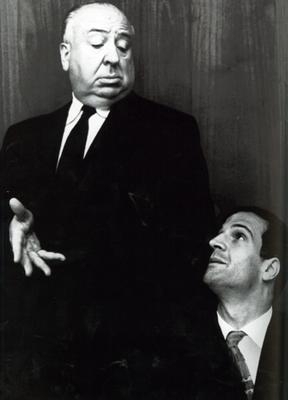 Hitchcock and Reville had known each other for a couple of years at this point, but had not developed a real relationship. In fact, she was surprised that Hitch asked her to work with him on “The Pleasure Garden” as assistant director. It’s not clear exactly why she was invited to join the small crew, though it’s easy to imagine that Hitch was attracted to both physically and because of her intelligence. In Patrick McGilligan’s Hitchcock bio, he refers frequently to “the three Hitchcocks” – the trios that wrote many of Hitch’s movies. Two of the trio were Alma and Hitch himself; the third changed many times over the years. And while Alma’s screen credits are few, she remained active as a co-writer and story editor on Hitch’s films through the end of the 1940s; she also wrote quite a few screenplays on her own. While it’s hard to judge the movie as a whole from this brief clip, there’s a lot to enjoy here: The opening shot of the chorus girls descending the spiral staircase, that wonderful pan across the front row of (mostly) leering men, along with a young woman who’s asleep, and the older man’s out of focus view of the dancers. The film tinting helps to set the tone; it’s great that this clip includes this, as so few people seem to be aware that movies had any kind of color in the days before Technicolor. There are a few other clips of the film on youtube, most of which cover the same ground but are only a minute or two long. What’s interesting is that this is the kind of melodrama Hitchcock would revisit often in years to come as an alternative to thrillers. My friend Lance Woods (Hi, Lance!) points out that Newsweek recently posted the article “The Mother of All Horror Movies,” which looks at one of Alfred Hitchcock’s greatest movies, “Psycho.” It’s been 50 years since the movie made its debut, and it still enthralls viewers. I haven’t actually seen it since college, but I remember so much of it, most of all the shocking left turn the movie takes when it turns out to be not so much about Janet Leigh as Anthony Perkins. Hitch hints at awful things, but does so in a funny, voyeuristic way, something like the great cartoonists Edward Gorey, Charles Addams or Gahan Wilson. He takes you on a tour of the Bates Motel, talking about where people were killed without bothering to explain much – and that only makes the viewer want to know more. At the end, the quick cut to Janet Leigh in the shower, screaming, jolts you from the humor of Hitchcock, the TV host, back to the cold “reality” of the film itself. He’s demonstrating how easy it is to see even a ghastly subject in a humorous light – as long as it’s at a distance. Get too close, and it’s shocking. One more thought before I finish up for tonight. “Psycho” and “The Birds” gave Hitchcock a reputation for horror – but really, how many other movies did he make that could be called horror films? Yes, there was murder in many of the movies, but most of them were suspense films, full of spies. I’ll have to revisit this thought next fall, when I blog about “Psycho” for real – but I believe Norman Bates is unique in Hitchcock’s films: Not a villain, motivated by belief in evil or greed or jealousy, but a killer. I was fortunate enough to receive the double-disc DVD of “Psycho” for Christmas, thanks to my daughter. It’s full of extras that look absolutely captivating. Can’t wait. As I mentioned in my previous post, I consider myself a film buff. I like to watch movies, I like to think about them . . . I even cowrote a very funny screenplay a couple of years back in collaboration with my two daughters. I’ve loved movies as long as I can remember, and that includes talking and writing about them. I may have missed my calling as a critic of some kind – just take a look a this picture. 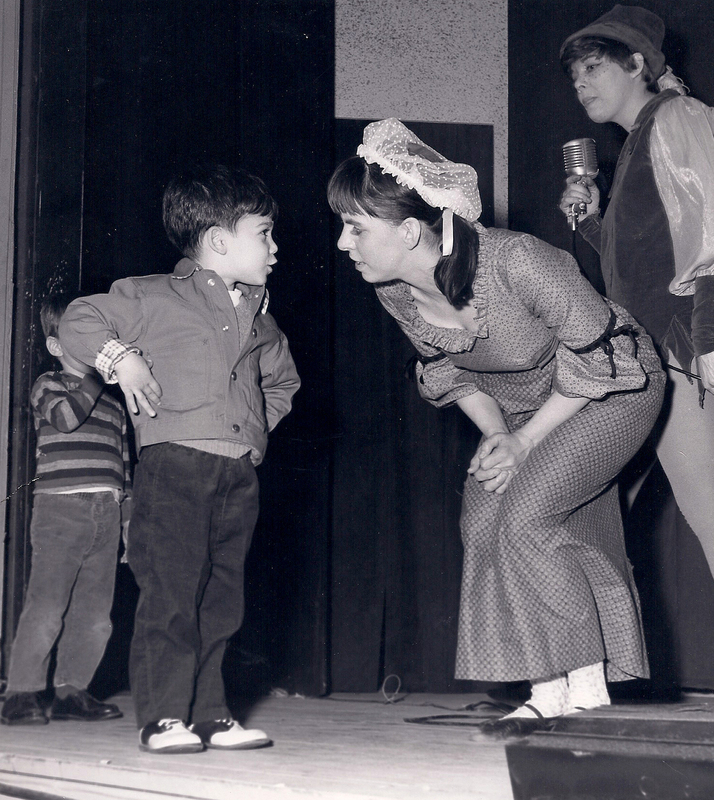 I’m about four years old, on stage at a children’s theater in Paramus, New Jersey, and telling the star what I think should have happened in the show. On stage at age four, voicing my opinions. Just because I happen to have it, here’s the U.U. 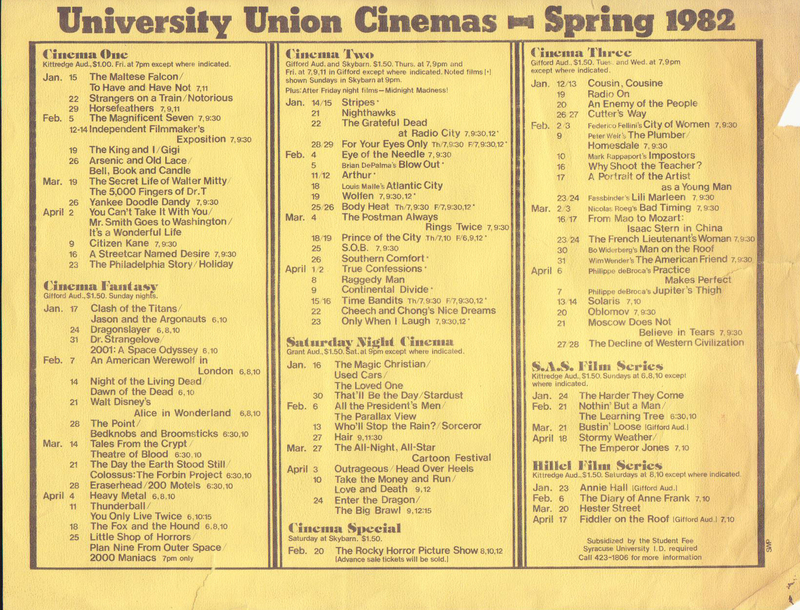 schedule for spring 1982. For some reason I didn’t note the movies I saw this time, although I could still list them. 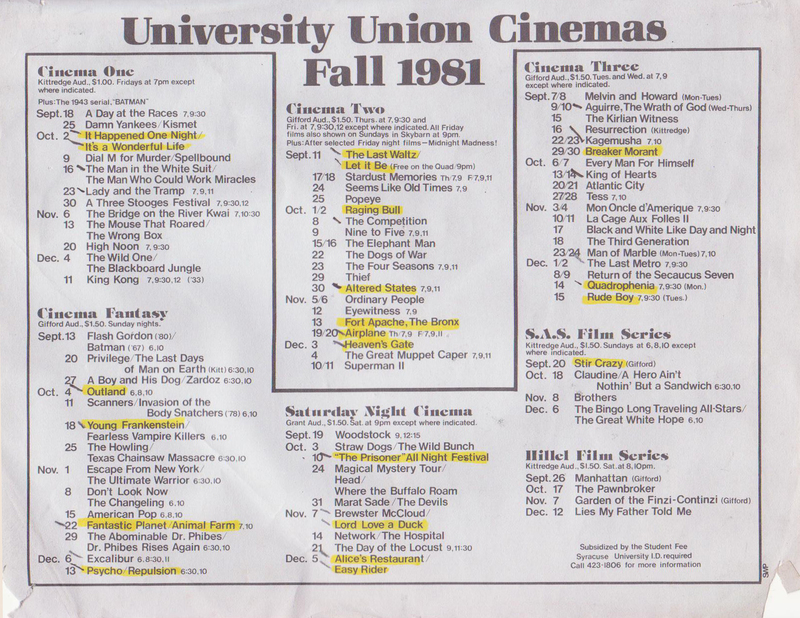 I have to wonder if Syracuse still has a film program anything like this. It doesn’t seem likely. And this sort of program was great not only for the movies we saw but for the insane intensity of the organizers. For example, our all-night “Prisoner” marathon only showed 10 episodes of the series . . . but the film board screened the other seven, not quite as good episodes during the day. Or the all-night “Planet of The Apes” fest, which, thanks to the distributor’s screwup, ended not with “Battle for The Planet of The Apes” but with . . . “Rabbit Test.” Mmm, that was one unhappy crowd! Okay, next up, we’ll take a quick look at the early days of Alfred Hitchcock’s career, including his first directorial effort, “The Pleasure Garden,” which, by the way, I still can’t find on DVD. And remember, ape shall not kill ape.